I fell in love with Lechon Asado – Cuban-style roast piglet – at a garden party hosted by Ramon at his finca in Pinar del Rio where Cuba’s finest tobacco grows. Thereafter, wherever my travels took me I made it a point to test and taste lechon every time I saw an eatery that featured the dish on the menu. I was dying to discover a place where lechon tasted exactly like it had tasted at Ramon’s finca in 1959. 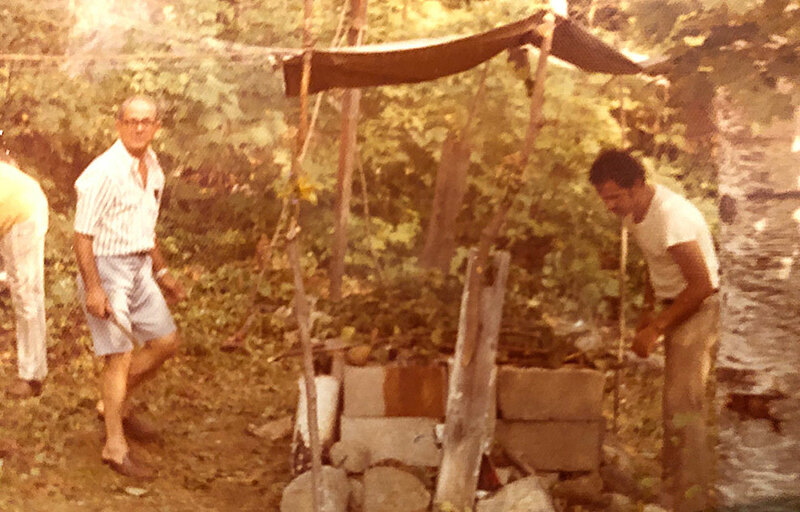 The years passed and I did not run into Ramon again before 1969, in – of all places – my home town, Montreal, the city to which he and his family had fled to get away from Castro. I immediately invited him and his folks to spend a week-end at my country house so that I could talk him into helping me host a garden party featuring his kind of Cuban lechon. He was all for it. Then we hit a snag: where to find two piglets about 18 to 20 pounds each to feed the forty or so hungry people we were planning to invite. The solution came from an unlikely source: my client, a Jewish fish monger, had the right contacts. Next morning, Ramon and I got up at five and started the day with a shot of rum, followed by strong, sweet Cuban coffee and a good cigar. Then we lit a charcoal fire in the pit. When the heat reached six hundred degrees Fahrenheit we placed the piglets over the fire skin down to make chicharrones – crackling. The heat was then reduced to one hundred and eighty degrees and we turned the piglets over, covered them with SaranWrap and let them cook for six hours. We did this on every Saturday before Labour Day for twenty-three consecutive years. The menu was the same year after year: lechon, black beans and rice, salad and for desert, chocolate cake. For drinks we served ‘fortified’ (with cognac) Sangria and Cuban coffee. In the twenty-fourth year Ramon and his family failed to show up. Panicked, I tried to contact them, but without success. Luckily, my son and an old friend of mine, Ed, were in town and they helped me save the day. The following Tuesday I was finally able to reach Ramon. He told me that a car had hit his wife, Alma, as she was crossing the street on Friday morning and that she had suffered a very serious head injury. Alma remained in a coma for three years, but Ramon never gave up on her. He went to see her in the hospital every day, massaged her hands and feet, talked to her and read books and newspaper articles to her as if she were fully functional. Three years later her husband was marinated in grief ! Die gonifff! you made me drool with food lust. One of my favourites cuisines: Cuban asado with christos e moros! And what a beautiful end to a touching story of love and devotion. My Spouse to be if from Constanza in Dominican Republic. She and her family introduced me to chicharrone during Christmas, the marinating, preparing the spit, building the fire, it a tradition. All to say that I share your feeling of having to try a sample of that delicious meat on every occasion I have.